Magnetic nanoparticles attached to polymers have been successfully used to target and remove unwanted flavour compounds from wine. Researchers at the University of Adelaide in South Australia have developed a polymer for soaking up methoxypyrazines in Cabernet Sauvignon, a compound known to produce an undesirable green capsicum aroma. They attached magnetic nanoparticles to the polymers and used magnets to remove the polymers from the wine once the methoxypyrazines had been extracted. The research has been published in the American Chemical Society's Journal of Agricultural and Food Chemistry. University of Adelaide Associate Professor in Wine Science David Jeffery said magnetic polymers could be potentially used to target and remove other wine faults such as smoke taint and ladybug taint. He said previous solutions were non-selective and relied on the tainted compounds being masked or forced to settle at the bottom of tanks. "In the making of this polymer you could tune it for other taint compounds or off-aromas," Associate Professor Jeffery said. "The idea would be to be very selective for the compounds you're wanting to use and that's been the problem with other treatments, they're quite non-selective." "There are patents out there around using molecularly imprinted polymers for taint removal from wine and also for removing methoxypyrazines but I think the novelty really is in having the attached magnetic nanoparticles and to my knowledge it is the first time that it's been applied to wine like this." The researchers tested the magnetic polymers in Cabernet Sauvignon spiked with a perceptible amount of an alkyl methoxypyrazine known to occur in the variety in cool climate regions or if fruit is picked too early. Using gas chromatography and mass spectrometry, the research team concluded that the magnetic polymers removed the compound from Cabernet Sauvignon more effectively than polylactic acid film. A group of taste testers also found the new approach removed these molecules without dampening the wine's distinct aroma intensity. The researchers also found the polymers could be regenerated and used five times without losing any ability to remove the targeted compound. 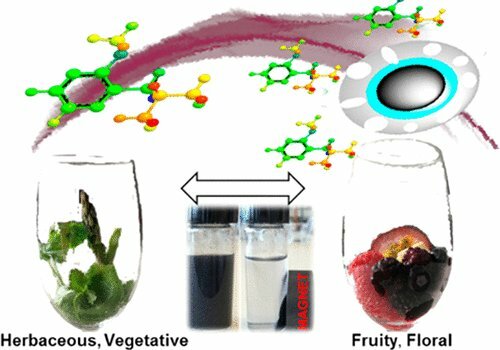 As the unwanted compound is in the fruit and not caused by the winemaking process, Associate Professor Jeffery said the magnetic polymers would likely be best used at the juice stage but could theoretically be used at any point of the winemaking process. However, he said much more research, such as techno-economic analysis, would be required before the findings could be commercialised. "There's a lot of work that needs to be done still to figure out how you would best implement this in a winery," Associate Professor Jeffery, who also wrote Understanding Wine Chemistry in 2016 with US co-authors Andrew Waterhouse and Gavin Sacks, said. "We just used bar magnets in the lab but on an industrial scale you would need to use something a bit more sophisticated like an electro magnet that could be switched on and off so you can trap the particles and then release them again once you've removed them from the wine and cleaned them." South Australia produces about 50 per cent of Australia's wine and is home to the leading regions of Barossa and McLaren Vale and brands including Penfolds, Jacob's Creek, Hardys Wines and Wolf Blass. 3-Isobutyl-2-methoxypyrazine (IBMP) is a potent odorant present in grapes and wines that is reminiscent of green capsicum. Suprathreshold concentrations can lead to obvious vegetative characters and suppress desirable fruity aroma nuances in wines, but options to manage IBMP concentrations are limited. This work investigated pre- and postfermentation addition of a putative imprinted magnetic polymer (PIMP) as a remedial treatment for elevated concentrations of IBMP in Cabernet Sauvignon grape must in comparison to nonimprinted magnetic polymer (NIMP) and to a commercially available polylactic acid (PLA) based film added postfermentation. Chemical and sensory analyses of wines showed that PIMP treatments were more effective than PLA film for decreasing "fresh green" aroma nuances without negatively impacting overall aroma profiles and that postfermentation addition of a magnetic polymer removed up to 74% of the initial IBMP concentration compared to 18% for PLA. Prefermentation addition of magnetic polymers removed 20–30% less IBMP compared to that of postfermentation addition but also had less of an effect on other wine volatiles and color parameters.